In engineering practice, settlement of foundations are experimentally determined or numerically modelled based on conventional saturated soil mechanics principles. The study area, Oferekpe in Abakaliki LGA of Ebonyi State, South Eastern Region of Nigeria is characterised with sedimentary formations highly susceptible to compression under applied load. The study was aimed at evaluating raft footing settlement by both analytical and numerical modelling methods and determine the effect of raft thickness on settlement. Standard penetration test (SPT) data was used to correlate soil properties that were used together with laboratory results to obtain the input parameters used for the prediction of settlement. Four footing embedment depths of 1.5, 3.0, 4.5 and 6.0 m with applied foundation pressures of 50, 100, 200, 300, 400 and 500kN/m2 were considered using a raft footing dimension of 20 x 20 m2 at varying thickness of 0.5, 0.75 and 1.0 m. The numerical modelling finite element application package used was Plaxis 3D. For applied pressure of 100 kN/m2 and at footing embedment depths of 1.5, 3.0, 4.5 and 6.0 m, settlement values of (21.89, 11.51, 9.04 and 6.52), (19.70, 8.60, 6.41 and 4.39), (25.62, 14.88, 12.05 and 9.27) and (25.20, 11.59, 5.57 and 2.58) were respectively predicted by the elastic, semi-empirical, empirical and finite element methods. The elastic method of predicting foundation settlement proposed by Steinbrenner yielded a very close range results generally to those predicted by finite element method. It was generally observed that thickness of raft footing has no significant effect on the predicted settlement. Klemencic R, McFarlane I, Hawkins N, Nikolaou S. NEHRP Seismic Design Technical Brief No. 7-Seismic Design of Reinforced Concrete Mat Foundations: A Guide for Practicing Engineers. 2012. Hussein H. Effects of flexural rigidity and soil modulus on the linear static analysis of raft foundations. J Babylon Univ Pure Appl Sci 2011;19. Chaudhary MTA. FEM modelling of a large piled raft for settlement control in weak rock. Eng Struct 2007;29:2901–7. doi:https://doi.org/10.1016/j.engstruct.2007.02.001. Ornek M, Demir A, Laman M, Yildiz A. Numerical analysis of circular footings on natural clay stabilized with a granular fill. Acta Geotech Slov 2012;1:61–75. Salahudeen AB, Eberemu AO, Ijimdiya TS, Osinubi KJ. Prediction of bearing capacity and settlement of foundations in the south-east of Nigeria, Book of Proceedings. Mater. Sci. Technol. Soc. Niger. Kaduna State Chapter Conf. July16, NARICT, Zaria, 2016. Salahudeen AB, Eberemu AO, Ijimdiya TS, Osinubi KJ. Empirical and numerical prediction of settlement and bearing capacity of foundations from SPT data in North-West region of Nigeria. Niger J Eng 2017;23 No.2:31–41. Johnson K, Christensen M, Karunasena NSW. Simulating the response of shallow foundations using finite element modelling 2003. Salahudeen AB, Ijimdiya TS, Eberemu AO, Osinubi KJ. Prediction of bearing capacity and settlement of foundations using standard penetration data in the South-South geo-political zone of Nigeria, Book of Proceedings. Int. Conf. Constr. Summit, Niger. Build. Road Res. Inst., 2016. Al-Jabban MJW. Estimation of standard penetration test (SPT) of Hilla city-Iraq by using GPS coordination. Jordan J Civ Eng 2013;7:133–45. Ola SA. Tropical soils of Nigeria in engineering practice 1983. Sadeeq JA, Salahudeen AB. STRENGTH CHARACTERIZATION OF FOUNDATION SOILS AT FEDERAL UNIVERSITY LOKOJA BASED ON STANDARD PENETRATION TESTS DATA. Niger J Technol 2017;36:671–6. doi:http://dx.doi.org/10.4314/njt.v36i3.2. Obasi AI, Okoro AU, Nweke OM, Chukwu A. Lithofacies and paleo depositional environment of the rocks of Nkpuma-Akpatakpa, Izzi, Southeast Nigeria. African J Environ Sci Technol 2013;7:967–75. Salahudeen AB, Aghayan S. Settlement Modelling of Raft Footing Founded on Oferekpe/Abakaliki Shale in South East Region of Nigeria. 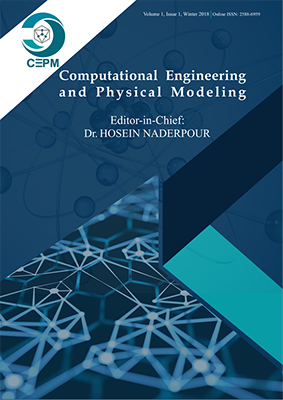 J Comput Eng Phys Model 2018;1:68–82. Terzaghi K, Peck RB, Mesri G. Soil mechanics in engineering practice. John Wiley & Sons; 1996. Schultze E, Sherif G. Prediction of settlements from evaluated settlement observations for sand. Proc. Eighth Int. Conf. Soil Mech. Found. Eng., vol. 1, 1973, p. 225–30. Das BM. Elastic settlement of shallow foundations on granular soil: a critical review 2015. Bolton Seed H, Tokimatsu K, Harder LF, Chung RM. Influence of SPT Procedures in Soil Liquefaction Resistance Evaluations. J Geotech Eng 1985;111:1425–45. doi:10.1061/(ASCE)0733-9410(1985)111:12(1425). Skempton AW. Standard penetration test procedures and the effects in sands of overburden pressure, relative density, particle size, ageing and overconsolidation. Géotechnique 1986;36:425–47. doi:10.1680/geot.1986.36.3.425. Brinkgreve RBJ. Tutorial Manual PLAXIS 3D Foundation. Delft Univ Technol Plaxis Bv, Netherl 2013. ASTM. Standard Test Method for Penetration Test and Split Barrel Sampling of Soils (D1586). West Conshohocken 2001. doi:http://dx.doi.org/10.4314/njt.v36i3.1. Bowles LE. Foundation analysis and design. McGraw-hill; 1996. Düzceer R. Observed and predicted settlement of shallow foundation. 2nd Int. Conf. New Dev. Soil Mech. Geotech. Eng., 2009. Shahin MA, Jaksa MB, Maier HR. Predicting the settlement of shallow foundations on cohesionless soils using back-propagation neural networks. Department of Civil and Environmental Engineering, University of Adelaide; 2000. Ahmed AY. Reliability analysis of settlement for shallow foundations in bridges 2013. Schmertmann JH, Hartman JP, Brown PR. Improved strain influence factor diagrams. J Geotech Geoenvironmental Eng 1978;104. Burland JB, Burbridge MC. Settlement of foundations on sand and gravel. Inst. Civ. Eng. Proceedings, Pt 1, vol. 76, 1985. Mayne PW, Poulos HG. Approximate Displacement Influence Factors for Elastic Shallow Foundations. J Geotech Geoenvironmental Eng 1999;125:453–60. doi:10.1061/(ASCE)1090-0241(1999)125:6(453). Becker DE, Moore ID. Canadian foundation engineering manual 2006. Raymond GP. Settlement of Foundations. Geotechnical Engineering 1997:113 – 126. SALAHUDEEN BA, SADEEQ JA. Evaluation of bearing capacity and settlement of foundations. Leonardo Electron J Pract Technol n.d.;15:93–114. Salahudeen AB, Sadeeq JA. INVESTIGATION OF SHALLOW FOUNDATION SOIL BEARING CAPACITY AND SETTLEMENT CHARACTERISTICS OF MINNA CITY CENTRE DEVELOPMENT SITE USING PLAXIS 2D SOFTWARE AND EMPIRICAL FORMULATIONS. Niger J Technol 2017;36:663–70.